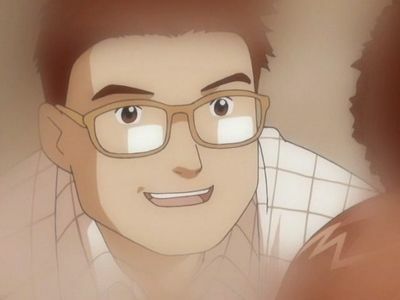 We had already gotten a head's up that the origin of Digimon was not only going to be explored, but even important to the plot. Here we peel the curtain back just a little bit more, confirming that Janyuu Wong was one of the programmers that researched the original AI program. Meanwhile, another programmer appears to be trying to influence the battle between the tamers and the Devas. This is one of those episodes that we're going to hail as an example of youth-friendly Lain-like cyberpunk, right? Here's the thing- learning Janyuu's full role is nice and having this Shibumi fellow in the shadows is just plain cool, but it doesn't add up to a whole lot. It's a piece of the puzzle, but on its own doesn't make the picture any clearer. It's a neat trick where we are presented with a lot of information that we either already know or doesn't really matter. And Shibumi's stunt with the blue card has plenty of holes, leading to a episode that feels like exemplary Tamers until you put some thought into it. The way Janyuu stumbles upon Terriermon is so mundane that it's crazy to think that not only did Henry never account for the possibility his dad would walk through the park, but that nobody ever had before. 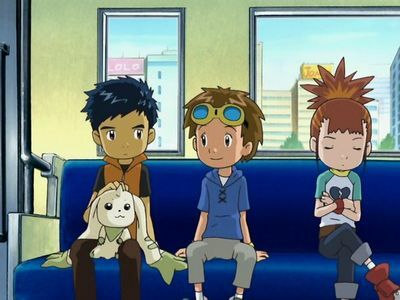 While bystanders had no trouble inventing their own explanations for Guilmon, in many ways seeing smaller Digimon like Terriermon and Impmon talking is less defensible. No cosplayer can get into a costume that small. Impmon attacking and scorching Janyuu was a nice touch as it proved the Digimon were tangible and created an element of danger. But still, you'd think something like this would have happened by now. As for this blue card business, it's fun to think that this Shibumi guy is manipulating everything behind the scenes, aiding the tamers by sneaking special cards to them that allow Ultimate evolution. But think about what had to happen for Henry to get this card: Shibumi dropped a card in some random kid's set in Akihabara. Random kid traded to a second random kid who traded to a third random kid who traded to Jeremy (who might as well be a random kid) who traded to Kenta who gave it to Henry just because. There is no possible way Shibumi could have foreseen all those trades, and yet that card is useful only to a Digimon tamer (it must be pretty worthless in the game if five kids were so eager to get rid of it). That only logical explanation would be that Shibumi is giving these cards to kids all over town, which is just plain irresponsible. Does he want every kid in Tokyo to become a tamer? Well, probably, but that hasn't happened. So let's move on. Takato, Henry and Rika embark on a quest to track down the origins of this blue card. Rika calls it stupid, which isn't true. It's crazy to think they'd actually be able to track down three random kids and the man in the yellow jacket in Akihabara, but the potential payoff would make it worthwhile. What is stupid is bringing Rika along, as she has no part in any of this. But God forbid they leave Rika out of two straight episodes. It's also two straight episodes now where the Devas bio-emerge right at the not-Shinjuku locale where the tamers happen to be. These strange coincidences aren't unique to Digimon so you can't fault them much for it, and the dual attack from Pajiramon and Vajramon presents a genuine threat with Guilmon sitting this one out. There wasn't much doubt that the blue card would come into play, of course, and Henry using modify card after modify card before reaching for it was just insulting. I do hope he's gotten past that whole fear of evolution thing, because he looked pretty incompetent for a bit there. It's not an episode that holds up well under close scrutiny, but at least it presents us with enough goodies to scrutinize. Plus there's that thing about Renamon leaving with Vajramon in the end. That's fun. Much as we've seen of Rika's nice side recently, it's nice to see that she's far from going soft. Her attitude on the train and around Numbah Seven was priceless. 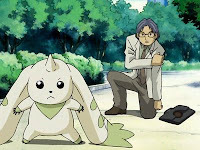 Janyuu's nervous about lying to his son and Henry doesn't want to talk about Terriermon around his dad. Good thing they patched things up at the end because that relationship was heading in a bad direction all of a sudden. Speaking of patching things up, Impmon's fireball was very real as Janyuu had his arm bandaged up at the end of the episode. We've seen humans take side damage from Digimon before, but getting targeted and hurt by a direct attack is really rare. So... what's up with the Devas chowing down on electronics? They've never had to do that before and seemed to be an excuse for their rampage, especially in Akihabara. And yes, feel free to take that as a Di Gi Charat reference if you understand it. The Akihabara shopping district is best known as a mecca for geeks in Japan. Much like the Big Sight convention center Myotismon used to round up kids in Adventure, if you watch any anime where otaku are prominently featured, you'll see it eventually. Hey! Finally somebody clearly noticed Calumon in action. It was probably witnessed before, but this is the first time anybody (in this case, Takato) was actually seen reacting to Calumon's evo-beam. You have to get the feeling that the only reason Vajramon survived was because they didn't want to spend another episode introducing another Deva, only for it to end with him walking off with Renamon. There's really no explanation for his survival. On the Di Gi Charat crack: that series was pretty much the first thing that came to mind when I first watched that episode and Akihabara was brought up.